T4America created a clock to keep track of how much time the projects have been waiting for funding. WASHINGTON, D.C. — CityLab and Transportation 4 America report that 151 days, 20 hours, and 41 minutes have passed since President Trump signed a $1 trillion federal infrastructure bill and public transit agencies are still waiting for the $1.4 billion that was promised to transit projects across the U.S., with no clear reason being given by the Federal Transit Administration (FTA) as to why there is a holdup. Authorities in these cities have been counting on federal dollars to move ahead with planning and construction, with many already committing hundreds of millions in local resources toward their completion. The FTA’s procedural slowdown is worrying transit agencies, consternating commuters and advocates, and embarrassing the political leaders who championed the projects, reports CityLab, which also points out delays of any kind also tend to increase the costs of the projects. 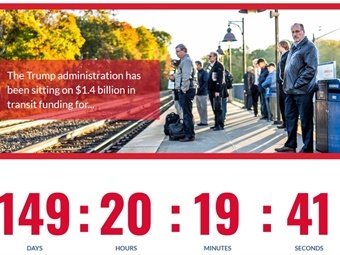 T4America has also created a clock to keep track of how much time the projects have been waiting for funding. To view the tracker, click here. For the full CityLab story, click here.